Gerbera flowers bloom in a wonderfully varied spectrum of colors, so you can take your pick between red, pink, yellow, orange or white blooms- and just about everything in between. Warm summery peach tones, mild creamy shades, to deepest crimson, gerbera flowers are simply a wonderful way to brighten someone's day. Perhaps this is part of the reason that gerbera flowers are one of the most popular bouquet choices as either cut flowers or in fresh flower arrangements. They are a sublime way to lift up someone's day. Therefore; they are a perfect choice to say "I am Sorry" on a gift note. Legend has it that those who receive the gift of gerberas will be relieved of the stress and sorrow of their regular, everyday life. In fact, when you look into the meaning associated with gerberas, you'll find that these cheery little blooms are famous for optimism and joy, and for a good reason. Consequently, white gerberas are often mixed with white carnations or orchids to create a funeral spray or elegant bouquet as a tribute. 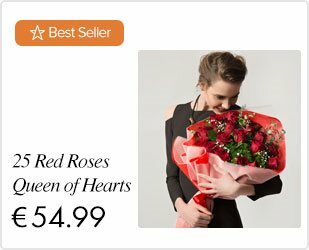 You can order funeral flowers online from LolaFlora for delivery to a church, funeral parlor or home. Although gerbera flowers originated in South Africa, now they are commonly found in many places in the world and are known for their alluring, open fan of petals and mild scent. When you look closely at a gerbera flower, you will undoubtedly notice the complex beauty of their natural design. From a distance, it appears as though at the top of the stem there is one flower, but upon closer inspection, you will notice that each 'flower' is composed of hundreds of smaller flowers. Gerberas have a distinct look and romantic appeal making them the perfect choice for colorful and sophisticated boutonnieres or corsages. Pair them with yellow roses, calla lilies or hydrangeas for a stunning bridal bouquet that is sure to turn heads. These perky flowers will also add a pop of color to any room or space. 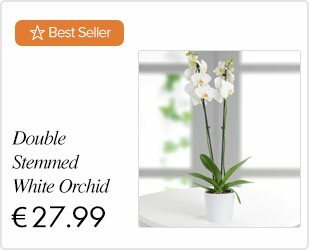 They are ideal as indoor potted plants, or you can place them in a vase and on a table for a stylish centerpiece. 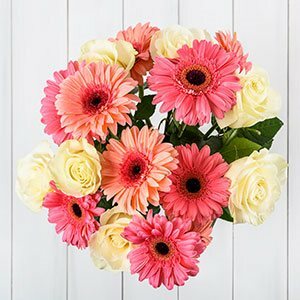 Gerbera flowers are flowers of celebration, so why not celebrate life by sending these beautiful blooms to someone who you think deserves it. Also as it is economical, put pink gerberas together with pink carnations for a sweet, but cheaply mixed bouquet. Sending a gerberas flower arrangement to that special person in your life will indeed be a memorable message of cheer and positivity. Don't hesitate, buy gerberas online and order early enough for same-day delivery. Sending a gerbera bouquet delivery has never been so simple with LolaFlora.